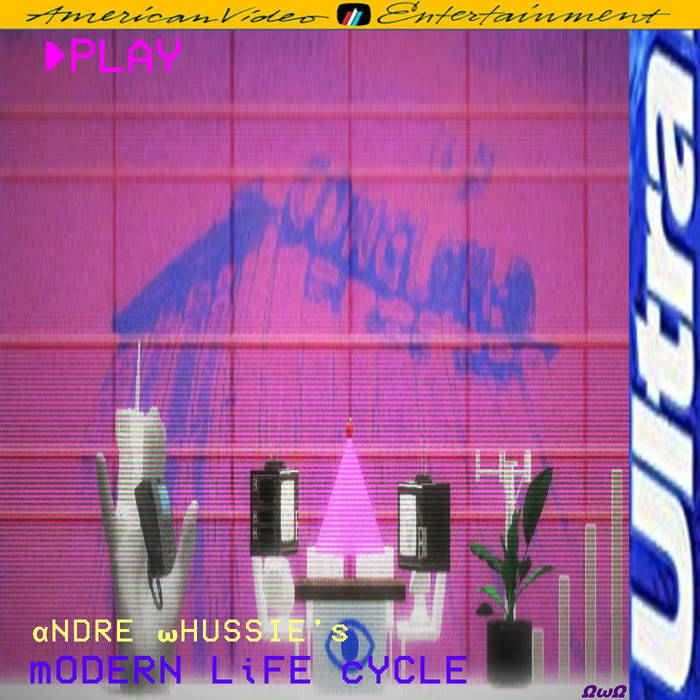 mODERN LiFE cYCLE, the latest full length release for αＮＤＲＥ ωＨＵＳＳＩＥ (a psuedonym of the enigmatic newcomer qwrty4) is an expansive odyssey of an album. A sprawling journey into an alien dimension of pure abstraction where sound waves swirl together, coalescing into a pulsating fabric out of which shifting forms rise and fall, a place where nothing holds together long enough for the listener to be able to put their finger on exactly what they are experiencing. The result is like a vaporwave botnet gone rogue, an automated musical algorithm left to work unsupervised in some dark corner of cyberspace slowly unravelling its own programming… a flurry of random media pulled out of the infinite flow of the ever expanding universe… twisted data, mutated into something truly post-human. Beyond abstract, mODERN LiFE cYCLE is deeply psychedelic, an extremely visual listening experience that floods the mind’s eye with a brilliant kaleidoscopic mess of Day-Glo fractals that radiate outwards from the sound until all else is eclipsed. One thing that makes this album really special is qwrty4’s willingness to experiment with bringing together a disparate range of sounds and styles. Whilst most tracks are built on classic style sample curation qwrty4 very rarely lets things settle into a predictable groove. A great example of this is the track nOViOPHOBiA where the slowed down phrase “it’s too late” repeats over and over again, gradually glitching out more and more until it is disfigured into something unrecognisable. In the process the original loop loses all of its pop sensibilities and… jump cut into oblivion, shifting speeds and directions at such a velocity… it begins to sound like some sort of industrial machinery on the verge of collapse. This is juxtaposed cleverly with tracks like αντι ｓＯＣｉ▲Ｌ ｍＥＤｉ▲ or rookie_of_the_year.1987 which take the tiniest fragment of sound and build a beautiful ambient loops that repeat uninterrupted until the listener is lulled into deeply meditative state. qwryt4 also flirts with murky drones, such as on the track Όλοι παρακολουθούν＜ｙｏＵ＞, shimmering guitar-laden dream pop on NeΩＭΞＧΛplex: ＤｉＧｉＴｅＫ ｄ▲ＹＤＲＥ▲ＭＺ, and synth-heavy futuristic cyberpunk on ＬΛＭＢＤΛ Αριθμομηχανή Συγκρότημα／／ ＜｛［υπολογιζόμενοι κύκλοι μήκους κύματος］｝＞ ＼＼ among other indescribably experimental sound experiments. The result is a unique sound which singles qwrty4 out as a highly original producer with some very interesting ideas about the potential of sample-based music. mODERN LiFE cYCLE is a must listen for anyone who enjoys the more experimental side of vaporwave, particularly anyone interested abstract plunderphonics or drone (think The Skaters era James Ferraro). That said, I do not think that it is for everyone, and anyone with more traditional tastes may find this album’s constant subversion of genre tropes downright frustrating. Even so, if listeners are able to open third third eyes and tune into qwrty4’s vision it’s a trip well worth taking!! this review honestly led me into this album & I became quite immersed in it.